Today, we're going to talk about mic technique in the field, and by in the field, I mean hours from a major city, and thus, any hope of replacement gear. 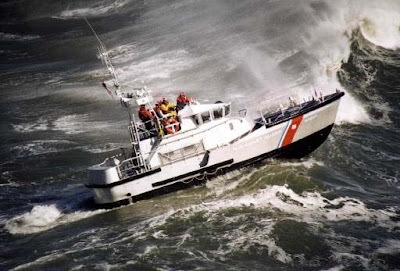 Recently, I was tasked with wiring Coast Guard crew members as they went on training maneuvers off of Cape Disappointment, Washington. Typically, they plow through ten to fifteen foot waves, with cold seawater showering them, which necessitates wearing a dry survival suit. These suits are just a few degrees removed from space suits, and thus provided their own challenge. I knew this in advance, a luxury in my field. So I spent most of the preceding evening working out a strategy to keep my mics and transmitters dry. Of course, as soon as I got there and saw the suits and the conditions first hand, I threw out 80% of what I'd come up with, and ended up doing the same thing I always do in such circumstances: I MacGuyvered it. The Countryman B3 lav mics are already known for their water-resistant qualities, but this was seawater flying over the bow of a boat (which, having gone out in it myself, is like being splashed in the face by a bucket every thirty seconds). To reinforce the mics, I cut a bit of latex from some generic exam gloves (available at any drugstore), and fit those over each capsule, like a miniature bathing cap. After fitting the mic's cap over the latex, I ran some electrical tape around the edge, making it completely waterproof down to the connector jack. I then rolled up some gaffer's tape into the trusty "football" triangles. This can be one of the most fool-proof ways to wire someone and ensure that the mic isn't going anywhere for the remainder of the day. While it can be bulky and less-than-discreet under civilian clothes, it would be perfect under the heavy layers of the suits. But now I had to deal with wind, and not just the occasional errant breeze; we were talking full on winds, some of which gusted up to 30 mph. For this, I used a Rycote Overcover. The Overcover is essentially a small, lav-sized cutout from the "dead cat" windjammer cover, used in full-sized mic wind screens. It is meant to be sandwiched against a Sticky, which is a pre-cut, double-stick tab included with the Overcovers. Since we were in harsher conditions than what it was intended for, I crossed my fingers that the gaff tape would hold it all in place. After placing the Overcover near the top of one triangle, I set the mic capsule half-way along the pad. After folding the Overcover in half over the mic, I placed the other gaff triangle on top, sandwiching the mic and the cover. I now had heavy wind protection, as well as extra water resistance. Finally, it came down to placing the mics. The survival suits are water and wind-proof, meaning that they're also essentially sound proof, so the old stand-bys of miking at the center of the chest were out. Normally, my next go-to would be at the neck, but the suits are equipped with a rubber gasket at the collar. Eventually, I settled on strapping the transmitter packs around the mid-section with a wireless belt, then running the mic up and out the gasket, along the side of the neck. Since the mic cable is so thin, little to no water slipped into the suit. I then fit the mic-tape-sandwich between the lapel and the survival vest. Not only did this hide the mic, it also held it in place even after the tape lost adhesion in the sea spray. Due to the logistics of the boat layout and the fact that the A-camera was in a waterproof bag, we settled on a wireless hop directly from talent, bypassing a mixer altogether, utilizing Sennheiser G2's. This also meant that no one would be monitoring audio during the shoot. Since it was a promo, and thus not intended for broadcast, the producer was very understanding about the set-up, reassuring me that "it is what it is." After the boat returned, we did a playback check, using a small DV camera's internal speaker. I was pleasantly surprised to hear very usable dialogue, even with wind, rain, sea spray, and a powerful diesel engine chugging along in the background. Your intrepid audio reporter, ready to face the treacherous seas...from the the safety of the dock. So we did it, and we lived to talk about it. This was the toughest rig I've encountered so far, though I'm sure that someday soon I'll consider it a stroll in the park...if the park had, say, gale-force winds on a daily basis. Expert speakers will provide an interesting and informative learning experience for everyone about impending issues with the FCC’s policies as well as the general principals of wireless applications. 'film music', is for independent and non-profit filmmakers, film students, and anyone in need of free music for their independent, non-profit film, video, or short.